yasp — a fully functional web-based assembler development environment, including a real assembler, emulator and debugger. The assembler dialect is a custom which is held very simple so as to keep the learning curve as shallow as possible. The 12-Factor App — twelve habits of highly successful web developers, essentially. Fast Approximation of Betweenness Centrality through Sampling (PDF) — Betweenness centrality is a fundamental measure in social network analysis, expressing the importance or influence of individual vertices in a network in terms of the fraction of shortest paths that pass through them. Exact computation in large networks is prohibitively expensive and fast approximation algorithms are required in these cases. We present two efficient randomized algorithms for betweenness estimation. imsg — use iMessage from the commandline. A System for Detecting Software Plagiarism — the research behind the undergraduate bete noir. 3D GIFs — this is awesome because brain. Hackers Gain ‘Full Control’ of Critical SCADA Systems (IT News) — The vulnerabilities were discovered by Russian researchers who over the last year probed popular and high-end ICS and supervisory control and data acquisition (SCADA) systems used to control everything from home solar panel installations to critical national infrastructure. More on the Botnet of Things. mcl — Markov Cluster Algorithm, a fast and scalable unsupervised cluster algorithm for graphs (also known as networks) based on simulation of (stochastic) flow in graphs. Facebook to Launch Flipboard-like Reader (Recode) — what I’d actually like to see is Facebook join the open web by producing and consuming RSS/Atom/anything feeds, but that’s a long shot. I fear it’ll either limit you to whatever circle-jerk-of-prosperity paywall-penetrating content-for-advertising-eyeballs trades the Facebook execs have made, or else it’ll be a leech on the scrotum of the open web by consuming RSS without producing it. I’m all out of respect for empire-builders who think you’re a fool if you value the open web. AOL might have died, but its vision of content kings running the network is alive and well in the hands of Facebook and Google. I’ll gladly post about the actual product launch if it is neither partnership eyeball-abuse nor parasitism. Map Projections Illustrated with a Face (Flowing Data) — really neat, wish I’d had these when I was getting my head around map projections. Pebble Gets App Store (ReadWrite Web) — as both Pebble and MetaWatch go after the high-end watch market. Wearables becoming more than a nerd novelty. Thinking About the Network as Filter (JP Rangaswami) — Constant re-openings of the same debate as people try and get a synchronous outcome out of an asynchronous tool without the agreements and conventions in place to do it. He says friends are your social filters. You no longer have to read every email. When you come back from vacation, whatever has passed in the stream unread can stay unread but most social tools are built as collectors, not as filters. Looking forward to the rest in his series. Jacob Appelbaum’s CCC Talk — transcript of an excellent talk. One of the scariest parts about this is that for this system or these sets of systems to exist, we have been kept vulnerable. So it is the case that if the Chinese, if the Russians, if people here wish to build this system, there’s nothing that stops them. And in fact the NSA has in a literal sense retarded the process by which we would secure the internet because it establishes a hegemony of power, their power in secret to do these things. How Well Does Name Analysis Work? (Pete Warden) — explanation of how those “turn a name into gender/ethnicity/etc” routines work, and how accurate they are. Age has the weakest correlation with names. There are actually some strong patterns by time of birth, with certain names widely recognized as old-fashioned or trendy, but those tend to be swamped by class and ethnicity-based differences in the popularity of names. Pidder — browser-crypto’d social network, address book, messaging, RSS reader, and more. What I Learned From Researching Almost Every Single Smart Watch That Has Been Rumoured or Announced (Quartz) — interesting roundup of the different display technologies used in each of the smartwatches. Modeling Users’ Activity on Twitter Networks: Validation of Dunbar’s Number (PLoSone) — In this paper we analyze a dataset of Twitter conversations collected across six months involving 1.7 million individuals and test the theoretical cognitive limit on the number of stable social relationships known as Dunbar’s number. We find that the data are in agreement with Dunbar’s result; users can entertain a maximum of 100–200 stable relationships. Thus, the ‘economy of attention’ is limited in the online world by cognitive and biological constraints as predicted by Dunbar’s theory. We propose a simple model for users’ behavior that includes finite priority queuing and time resources that reproduces the observed social behavior. Mary Meeker’s Internet Trends (Slideshare) — check out slide 24, ~2x month-on-month growth for MyFitnessPal’s number of API calls, which Meeker users as a proxy for “fitness data on mobile + wearable devices”. What I Learned as an Oompa Loompa (Elaine Wherry) — working in a chocolate factory, learning the differences and overlaps between a web startup and an more traditional physical goods business. It’s so much easier to build a sustainable organization around a simple revenue model. There are no tensions between ad partners, distribution sites, engineering, and sales teams. There are fewer points of failure. Instead, everyone is aligned towards a simple goal: make something people want. Augmented Reality Futures (Quartz) — wrap-up of tech in the works and coming. Instruction is the bit that interests me, scaffolding our lives: While it isn’t on the market yet, Inglobe Technologies just previewed an augmented reality app that tracks and virtually labels the components of a car engine in real time. That would make popping the hood of your car on the side of the road much less scary. The app claims to simplify tasks like checking oil and topping up coolant fluid, even for novice mechanics. The Remixing Dilemma — summary of research on remixed projects, finding that (1) Projects with moderate amounts of code are remixed more often than either very simple or very complex projects. (2) Projects by more prominent creators are more generative. (3) Remixes are more likely to attract remixers than de novo projects. Scratch 2.0 — my favourite first programming language for kids and adults, now in the browser! Downloadable version for offline use coming soon. See the overview for what’s new. State Dept Takedown on 3D-Printed Gun (Forbes) — The government says it wants to review the files for compliance with arms export control laws known as the International Traffic in Arms Regulations, or ITAR. By uploading the weapons files to the Internet and allowing them to be downloaded abroad, the letter implies Wilson’s high-tech gun group may have violated those export controls. Why isn’t social media more like real life? I finally got around to looking at my personal network graph on Linkedin Labs the other day. It was a fun exercise and I got at least one interesting insight from it. Take a look at these two well defined and distinct clusters in my graph. These are my connections with the startup I worked for (blue) and the company that acquired us in 2008 (orange). It is fascinating to me that all these years later the clusters remain so disconnected. 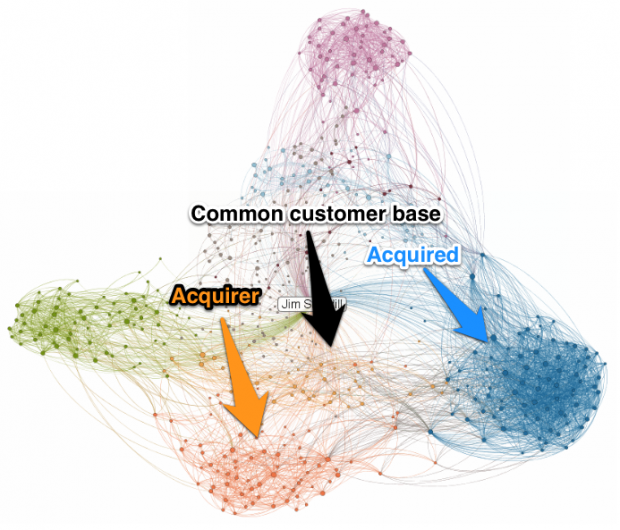 There are shared connections within a common customer base, but very few direct connections across the clusters. I would love to see maps from some of my other colleagues who are still there to see if theirs show the same degree of separation. This was an acquisition that never really seemed to click and whether this is a picture of cause or effect, it maps to my experiences living in it. That’s an aside though. What this graph really puts in stark relief is what every social network out there is learning about us. And this graph doesn’t really tell the whole story because it doesn’t represent edge weights and types, which they also know. Social networks know who we connect with, who we interact with, and the form and strength of those interactions. But this post isn’t a privacy rant. I know they know this stuff and so do you. What this image got me thinking about again is why social networks aren’t using this information to create for us a social experience that is more like our real world, and frankly more in tune with our human-ness. Social media properties plumb this data to know which ads to show us, and sometimes they use it to target messages to us more effectively. Remember those LinkedIn messages we got with the pictures of our friends? We all clicked on them. But they just don’t seem to be making that much effort to make use of what they know to innovate on our behalf, to improve our experience. For example, Facebook knows all of this too and yet they continue to cling to the curious fiction that our social life is one giant flat maximally-connected equi-weighted graph. A single giant room where we all stand shoulder to shoulder wondering who all of these strangers are. A place that refuses to acknowledge the nuance and complexity of our real world relationships. And Twitter, for all it’s wonderfulness, does the same thing. And Google Plus? Why are you making me curate circles? You know what they are. At least take a guess at making them for me. They call themselves social networks, but in terms of how they express themselves to us, their users, they seem to be using the word “network” the way broadcast television does. The experience is more analogous to a vast mesh of public access television networks than with the complexity and richness of real world social connections. You say something and it is presented to everyone, no matter which of those clusters they inhabit. So 10% care and the rest of them filter it. In the natural world of human-to-human conversation, communication travels person to person, modified and attenuated along the way. Or, in some cases, amplified into a cluster-spanning meme. I think it would be fascinating to see social media properties experiment with recreating some of these more complex dynamics. What if I could “talk” to a well-defined cluster in my graph and see the strength of the signal attenuate rapidly as the distance from that core increased? Not to make it invisible, but perhaps make its volume more appropriate to the another cluster’s contextual center of gravity. Or, in the inverse, knowing things about my graph Twitter could give me a really nice low-pass filter that gave preference to those in my stream that are “close” to me, or share a common edge type, but who might not be tweeting at high frequency. There are lots of possibilities along these lines. And I know that a big part of what makes these services useful is their simplicity. Fine. But ultimately, I wonder is all of this network science going to benefit me in any direct way as a user of these services, or is the whole field of data science ultimately about reverse engineering me for sake of advertisers? I wrote a post a while back about our paleolithic roots and the way we consume media. The “diet” part aside, what I’ve been thinking about a lot since is a digital design sense that caters to our neurological reality. Instead of designing for the convenience of the machines and demand that we adapt, design for who we actually are. Buggy. Tribal. Easily distracted. Full of bias. Curious. Whatever. I’m eager to see a more ambitious approach to design that infuses our digital worlds with more of the nuance and subtlety we find in the physical realm, all while preserving the reach that makes our digital world special. The Medium Terms of Service — easily the best terms of service I’ve ever read. Clear and English wherever possible, apologetically lawyered-up CAPITALS where necessary. Buy that lawyer a beer. All Nations Lose Under TPP’s Expansion of Copyright Terms (EFF) — leaks reveal the USA negotiators’ predictable attempt to expand the term of copyright in other nations. TPP is a multinational SOPA. Network Theory to Identify Origins of Outbreaks (MIT Technology Review) — “By monitoring only 20% of the communities, we achieve an average error of less than 4 hops between the estimated source and the ﬁrst infected community”. The paper says it depends on good knowledge of the network, which makes me wonder how useful it will be for government tracing of Anons and the like.